The invention of Dunkl operators in the late 1980ies has deeply influenced the modern theory of special functions and related harmonic analysis. Dunkl operators and their variants are naturally linked to the representation theory of affine Hecke algebras, and there are active areas of application such as Dunkl processes and quantum integrable systems. 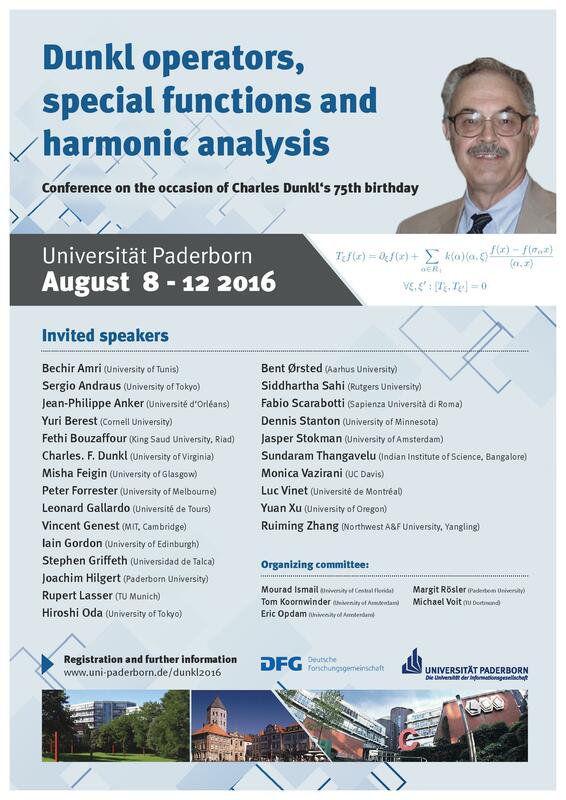 The focus of this conference will be on current developments in various fields inspired by Charles Dunkl's work. But it will also feature a broader range of related topics including harmonic analysis on symmetric spaces, special functions and orthogonal polynomials. Poster in pdf or jpg.